Christine Simmons, president and chief operations officer of the WNBA team Los Angeles Sparks, will present “The Triple Bottom Line of Social Entrepreneurship in Today's Climate” as part of the Margaret J. Weber Distinguished Lecture Series at Pepperdine Graduate School of Education and Psychology. The lecture will take place at the West Los Angeles Graduate Campus on Thursday, January 24, at 7 PM. Simmons is in her fifth season with the team and the fourth in her official capacity. She leads all aspects of the team's business operations, including ticket and sponsorship sales and service, marketing, game operations, communications, community relations, and finance. Under her leadership, the team has seen a 50 percent increase in ticket sales and increased viewership on Spectrum SportsNet. Her efforts have also impacted nearly 70,000 lives through community programs. Continually applying her life philosophy of “do more - do good - do well,” Simmons believes that her responsibility is more than leading a franchise to win championships, but rather to elevate girls and women to be leaders and make a cultural impact. 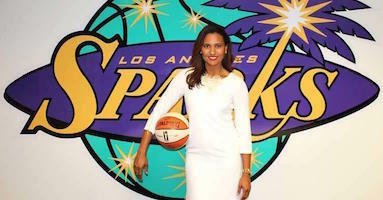 Prior to joining the Sparks, Simmons was an executive vice president with Magic Johnson Enterprises, where she evaluated investment opportunities and was responsible for business development. She has worked with many Fortune 500 corporations and multi-million dollar companies, and has been on the business side of entertainment for over a decade working for organizations such as Disney and NBCUniversal. For additional information about this free lecture, and to register to attend, visit the Margaret J. Weber Distinguished Lecture Series page on the Graduate School of Education and Psychology website.